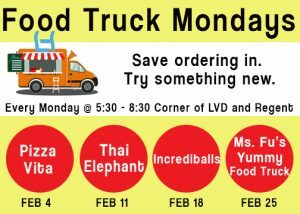 Every Monday we invite food trucks to help satisfy your appetite on the first day of the work week. Save the ordering in, try something different. Trucks will be parked on the corner of Liberty View Drive and Regent Street. There are no set schedules for the trucks, but typically they will be there between 5:30 and 8:30. The trucks are subject to change or cancel without notice.